Traffic incidents involving animals are a sad and unfortunately unavoidable aspect of driving. There is specific knowledge about animal behaviour that can help you avoid being involved in a collision with an animals. Knowing when you are more likely to encounter animals and how to react in traffic situations involving animals can dramatically reduce your risk of hitting an animal. Both wild and farm animals are frequently encountered on country roads. Although unfortunate, the animals gather near the road because water drainage create lush grass and watering holes. Try to always remain alert and aware of the increased chance of animal encounters in country areas - particularly during the times highlighted below. Road signs warning of the potential for animal encounters are there for a reason and should not be ignored. In these areas you should slow down to reduce your required stopping distance and increase your time to react. On top of adjusting your driving to suit the conditions, you should also remain alert to the increased potential for an encounter. It's easy for your speed to creep up on quiet, straight roads (prevalent in the country). However, even where the speed seems too slow for conditions, remember that the limits are in place for a reason. The seemingly slow limit may be in place to help prevent collisions with animals that are common in that area. So always drive at or below the limit and adjust your driving to suit conditions. Dawn and dusk are active times for wild animals. Dusk means falling temperatures that stir nocturnal animals to begin their hunt for the day's food and water. Dawn results in these animals returning to their shelter for sleep after a long night. These increased activity levels combine with poor lighting conditions to create a devastating combination for animals near roads. Animals become difficult to see and a driver's ability to detect and react appropriately is also reduced. Collisions with pets are far more likely to occur in residential areas. Domesticated animals aren't constantly searching for food, water, and shelter so encounters with them are far more random. It's most likely they will have escaped their yard without an owner's knowledge and are simply exploring their surroundings without a specific goal. Due to their unpredictable nature in these situations, it's important to always remain alert and scan constantly when driving in residential areas. Although there will be low traffic and reduced speed limits, remain alert and aware of the potential for unexpected encounters. Animals on the roadside are easy to scare and startle, so slow down on approach. It's likely the animal is just trying to find food and water and obviously won't be considering the potential for traffic on a road. Animals on the road are even more unpredictable. They will realise an oncoming vehicle as an immediate threat to their safety and as such will be startled, scared and panicked. 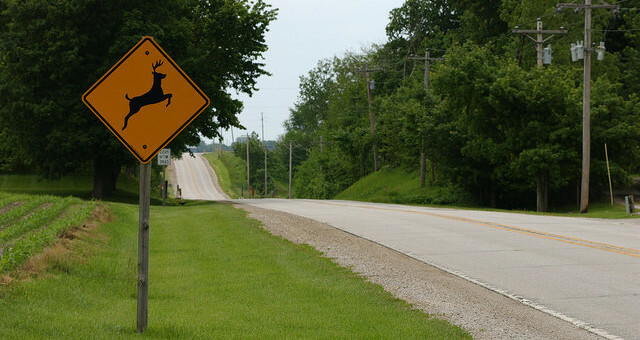 This will likely impair their decision-making skills and reflexes (deer caught in the headlights). This means it's up to you to know what to do and react appropriately as you approach an animal. If you see the animal from a distance, slow down to a speed at which stopping is easy if necessary. While still moving slowly, carefully move around the animal without startling it. Another potential encounter is an animal that appears suddenly from the roadside without warning. This is obviously the most dangerous situation for both you and the animal. You will have almost no time to make a decision and react accordingly. Because of this, if you should stay on your current course and slow down in a controlled manner (do not slam on the brakes). Even if you will hit the animal, it's vital that you do not swerve to avoid a collision. Doing so at any speed can result in loss of control and/or the vehicle to roll. In both situations, you may move into oncoming traffic and endanger the occupants of your vehicles along with other road users. It can be difficult to consider when in the situation (as everything happens so quickly), but remember that the life of animal is less important than your own and the those of other roads users. Avoid a collision with an animal whenever you can, but the steps you take to avoid that collision should never endanger a person's life. So the safest reaction to the sudden appearance of an animal into your vehicle's path is to remain on course, slow down as much as you can without losing control and collide with the animal.